Around £800,000 in funding has been awarded through our Partnership Funding to five Catalyst projects to expand their work as part of the REACH programme. 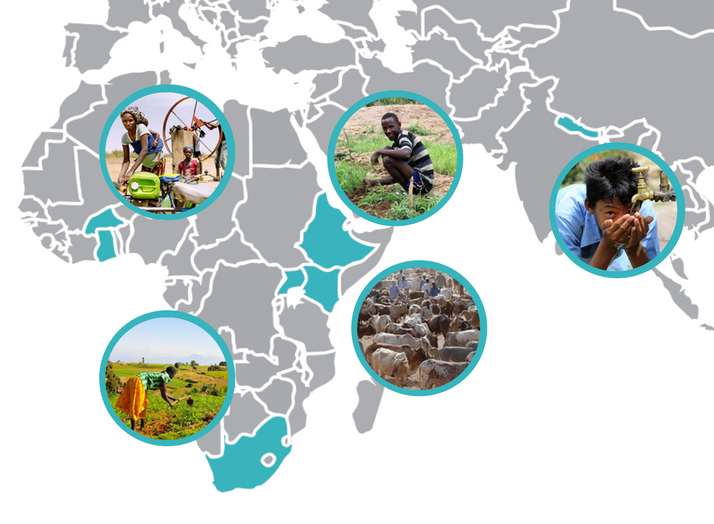 In 2016 twelve projects were successfully awarded a Catalyst grant to explore novel approaches to water security and poverty research and policy that complement the core research conducted by the REACH programme. The Accelerated grants build on the successes delivered through the Catalyst grants and will continue to contribute to the REACH programme’s aim to improve water security for five million poor people. Pastoralist communities in Northern Kenya face increasing water security risks attributable to disruptions in their hydro-climatic and socio-ecological environments. Sedentary pastoralists, women and children are most vulnerable to spatial-temporal variations in water availability. This vulnerability is exacerbated by embedded power relations within existing socio-cultural and water governance systems. The Catalyst grant study found subjective evidence that women with diversified livelihoods and social capital are more resilient to water stress. The Accelerated project will build on these findings aiming to provide empirical evidence on factors behind water security and factors that enhance resilience for vulnerable pastoralist communities. The study aims to achieve inclusive drinking water services in rural communities throughout Mid-Western Nepal, where water-related disease burden is among the highest nationwide. Activities as part of the Catalyst grant included the installation of field laboratories equipped for microbial and chemical analysis, training local staff in sampling and data management, and establishing a flexible mobile network for data management. The Accelerated project will broaden the scope of the Catalyst project by strengthening activities to include source conservation, chlorination of piped supplies, and a systematic evaluation of water quality, user experience and health. The project will also extend the geographic focus of the water safety interventions from two to five districts. Land degradation is a major cause of Ethiopia’s low and declining natural resource and agricultural productivity, persistent food insecurity, and rural poverty. This study aims to demonstrate water security for the poor can be improved through sustainable land management (SLM) interventions at community or micro-watershed scales. The focus of the Catalyst project to-date has been on participatory monitoring at community scale as an approach to enhancing climate and hydrological monitoring, particularly for shallow groundwater. The Accelerated project will advance a methodology for monitoring the impacts of watershed management interventions using selected indicators of hydrological performance, and will develop a tool for targeting SLM interventions that increases groundwater recharge. The project will also aim to consolidate community engagement through a gender inclusive approach. Across Africa, water law reforms have introduced new statutory permit systems with fees tied to permits, to govern the allocation of water resources. However large numbers of small-scale water users, especially women, are unable to access the formal permitting system, and therefore have less legal protection than large users with permits. The study explores how to transform permit systems to enhance regulatory efficiency and protect the most vulnerable. Expanding on the work achieved through the Catalyst grant, the Accelerated project will aim to understand pathways to achieving more effective pro-poor water abstraction regulation, and to decolonise permit systems to ensure legal protection of the most vulnerable. In Western Africa, women are responsible for collecting and managing water but have less influence in decision-making processes around water management. This makes them especially vulnerable to changes in water quantity and quality. The Catalyst Grant assessed women and men’s vulnerability to water, sanitation and hygiene (WASH) security risks in Burkina Faso. It found that disempowerment can limit coping and adaptive strategies to deal with a range of risks to household water security. This Accelerated grant will build on previous research to develop and pilot an innovative survey-based index to measure empowerment in the WASH sector in Burkina Faso and Ghana.